"All Occasions did a spectacular job helping us create our daughter's dream wedding, which was held in our backyard. They helped us create the perfect tent plan, trying to balance our dreams with the reality of the yard characteristics and our budget. They also helped create the decor for the inside, working collaboratively with our other partners, i.e. floral designer, caterer, lighting specialist, etc. And their execution of the plan was flawless. Their team on site was incredible...both in building the tent and also during the event. We would recommend without hesitation utilizing All Occasions for any event - corporate or private." "All Occasions has been great to work with and truly knows the meaning of excellent guest service. Their turn around time, response time and flexibility has really helped us out. It is a pleasure working with you. Kudos!! Kudos!! Kudos!!" "From our first meeting with Tommy Wilson, I knew we had made the right choice in selecting All Occasions Event Rental to create the "fairy tale" setting we wanted for our daughter's wedding. Tommy was personally involved from the beginning and his team of professionals created a setting that exceeded our expectations. The outdoor seating area for the ceremony was beautiful. We chose a 60' x 90' double peaked tension tent for the reception. It looked spectacular! Tommy was a comforting presence in a stressful, emotional and wonderful wedding day for our daughter. We became fast friends and insisted he be a guest at our wedding celebration. After the wedding, everything was removed quickly and Tommy's team returned all of our outdoor furniture to its original setting. I strongly recommend Tommy Wilson and All Occasions Event Rental for your party needs. We will certainly include them for our next great party." "When All Occasions is on the team, that is exactly what you get, a team! From the beginning to the end of the process, they work with you to determine and fulfill your needs. You can always count on them to deliver what they promise and at the time they promise -- and the order is correct when you get it. As a professional wedding planner, I can't express how important this is to me and to my events. We are so fortunate to have a company like All Occasions right here in our backyard. It is a joy to work with them and an honor to be able to recommend them." "Great American Financial Resources relies on All Occasions Event Rental as our primary event rental vendor for corporate events of all sizes. We love their wide product selection and quality inventory, as well as the creative approach and innovative ideas they bring to each of our events. What really sets them apart is their attention to detail and commitment to client satisfaction. We know that when All Occasions is part of our event planning team, our event will exceed expectations!" "The All Occasions team is truly amazing. Every time I've used them, they've provided me with innovative solutions and above-and-beyond service. A great example is the way they supported the grand opening of The Ascent. We had a conundrum - we needed a tent but still wanted our guests to be able to see the remarkable view of the building. 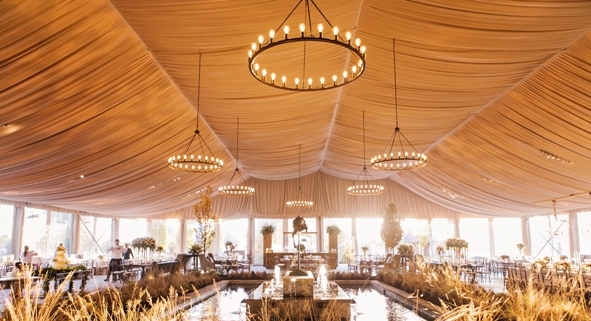 All Occasions developed the perfect solution - a clear topped tent - I love their innovation!" "We cannot thank All Occasions enough for the astounding beauty that resulted at our daughter's wedding thanks to their attention to detail and perfect planning and execution. We were all rendered speechless by how gorgeous the tent, lighting, draping, chandeliers, dance floor, linens and table settings turned out!! We sincerely appreciate Robert Hughes for sharing his talent and skill, which created the perfect backdrop for a magical day." "Ensemble Theatre of Cincinnati used All Occasions for a major fundraising event with great success. They provided efficient, affordable and professional service, and their staff worked well with our other vendors to make our event stress free and visually exciting. Their tent was perfect for our unique space. Whatever your special events needs might be, I fully recommend All Occasions Event Rental." "For my daughter's wedding, we found All Occasions Event Rental wonderful to work with. Because of their huge inventory, they were able to provide the perfect table linens for the occasion! I have another daughter getting married next year, and I'm already looking forward to working with All Occasions again!" "In the more than 20 years I have partnered with All Occasions Event Rental, I have always been impressed with the consistent level of staff support. The entire staff, from the delivery drivers to the sales associates, always take the next steps to remember all the critical little things that can so often fall through the cracks when putting together a special event. All Occasions makes us look good!!"